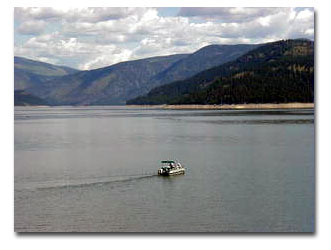 Information about fishing in Lincoln County and the Kootenai National Forest. 33 lb 1 oz, 38.6"
5 lb 2 oz, 21.14"
Montana lakes and streams are home to rainbow, brook, brown and cutthroat trout. The Kootenai River is considered a blue-ribbon trout fising river. 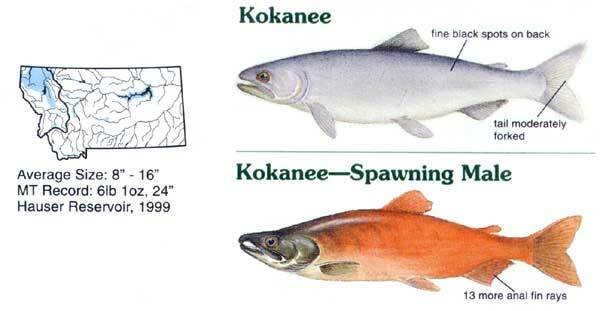 Lake Koocanusa contains trout as well as kokanee salmon. 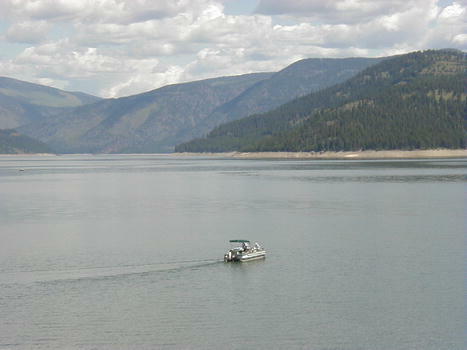 Montana's record small mouth bass was caught on a Kootenai National Forest lake. To fish in Montana, most anglers need two licenses: a Conservation License and a Fishing License. A Conservation License is needed before you can buy any fishing or hunting license that Fish, Wildlife & Parks (FWP) issues. Beginning March 2000, conservation license applicants will need to provide their social security number in addition to the information usually requested. Resident fishermen can now purchase a two-day fishing stamp and season license. A fishing license allows a person to fish for and possess any fish authorized by the state's fishing regulations. It is nontransferable and nonrefundable. The license enables one to fish from March 1 through the end of February of the following year. 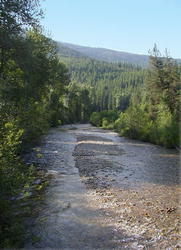 Check the current Montana Fishing Regulations for regulations for specific waters. All species of the family Salmonidae (chars, trout, salmon, grayling, cisco and whitefish); all species of the genus Stizostedion (sauger and walleye); all species of the genus Esox (northern pike and tiger muskellunge); all species of the genus Micropterus (bass); all species of the genus Polyodon (paddlefish); all species of the family Acipenseridae (sturgeon); the genus Lota (burbot or ling); and the species Ictalurus punctatus (channel catfish). Bull trout are defined as any trout with white leading margins on the lower fins and no markings on the dorsal fin. Fishing is allowed at all hours during open fishing seasons unless otherwise specified. 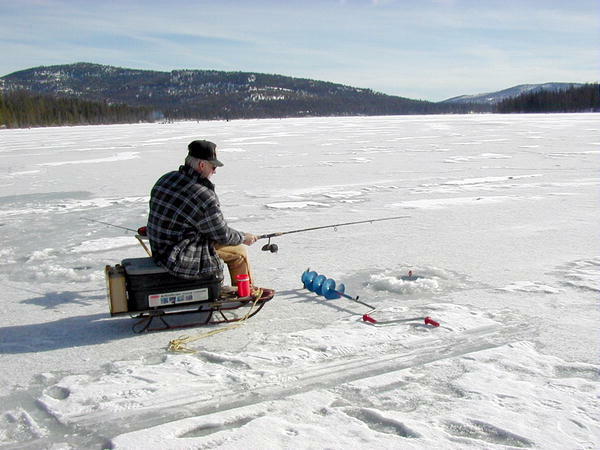 Ice fishing on Thompson Lakes photo by Maggie Craig. Fish graphics modified from the Montana Fishing Regulations book.